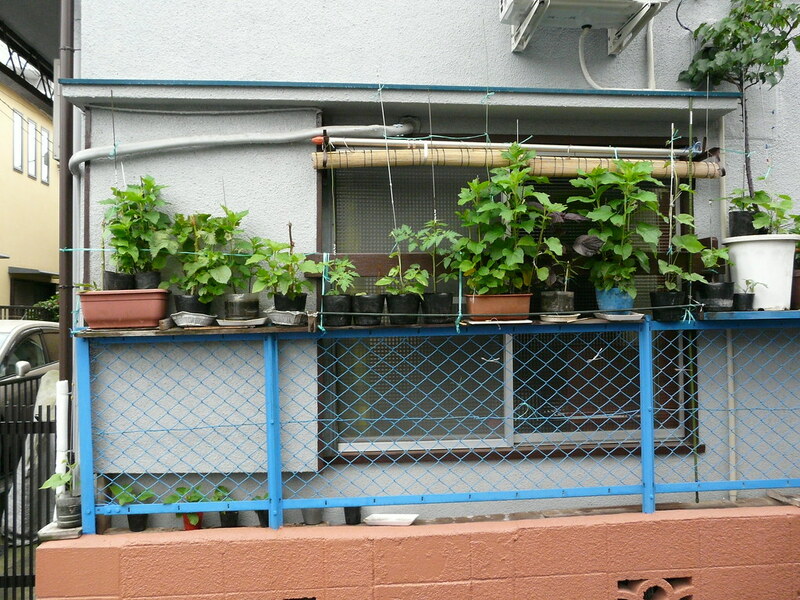 An interesting space-saving variation on the curbside/wall garden. 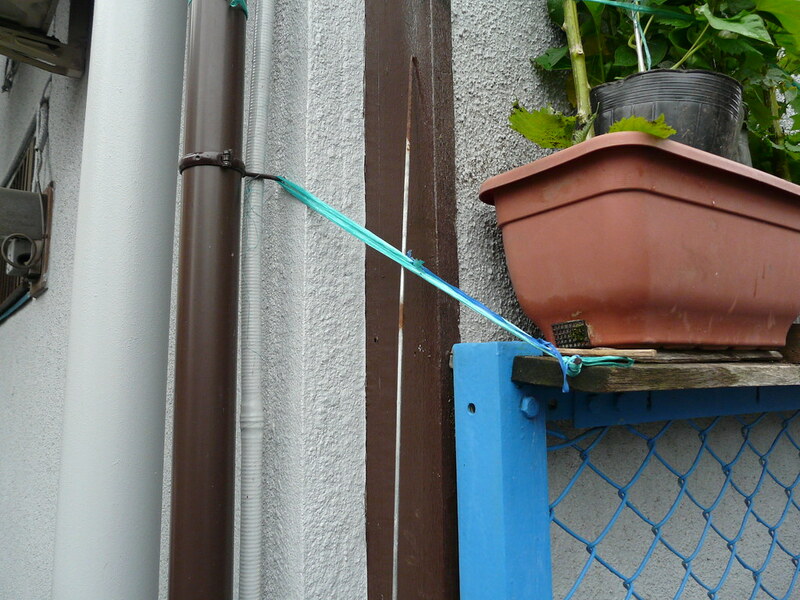 A thin plank of wood rests on top of a wire fence and is secured in place with wire and string tied to the guttering and drainpipes. 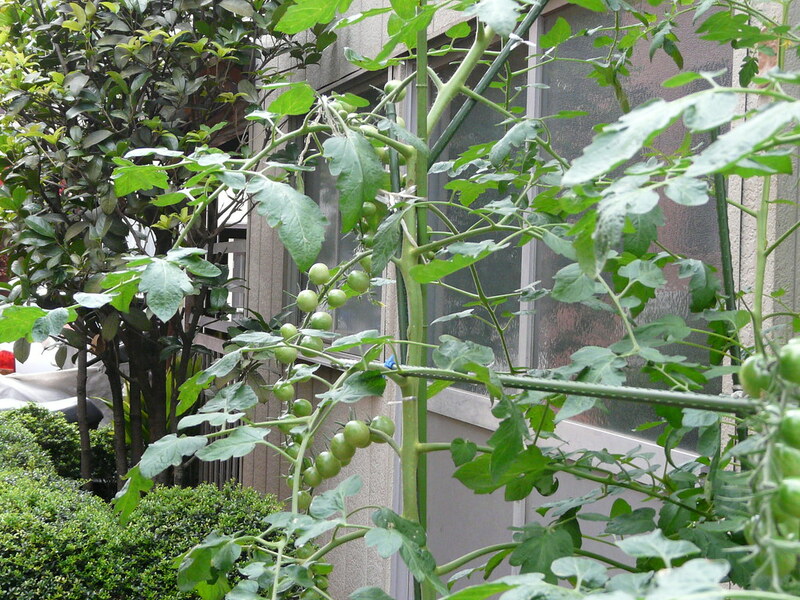 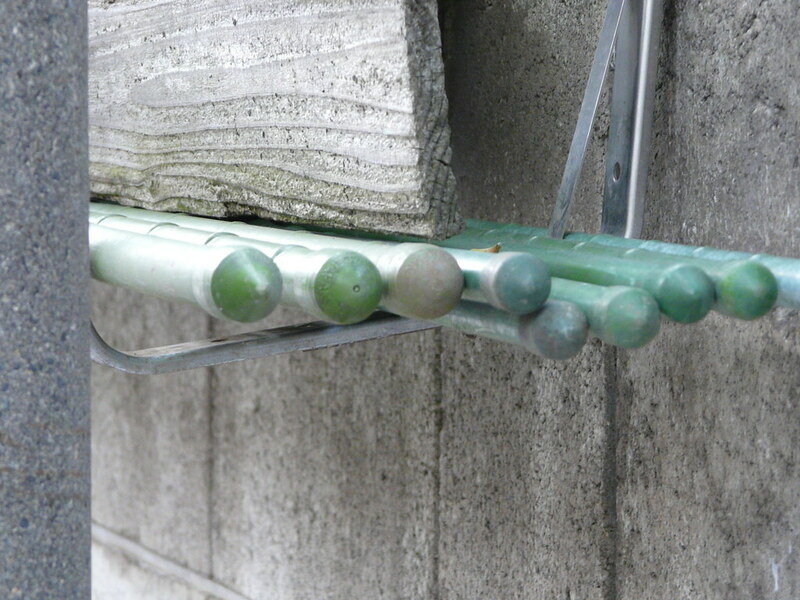 Extra safety is added through a long plastic gardening rod which acts as a railing along the front of the garden. 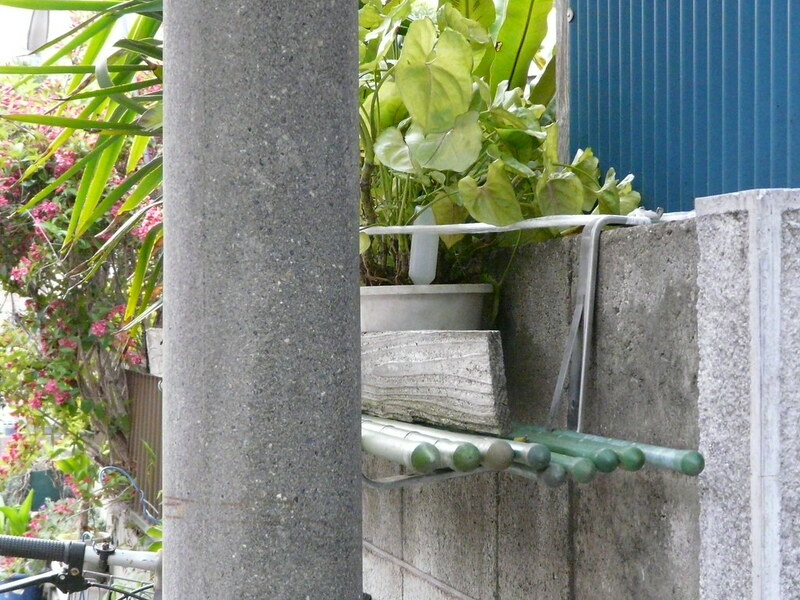 Precarious yet thoughtful, this construction does not intrude into the narrow thoroughfare any further than the curb line. 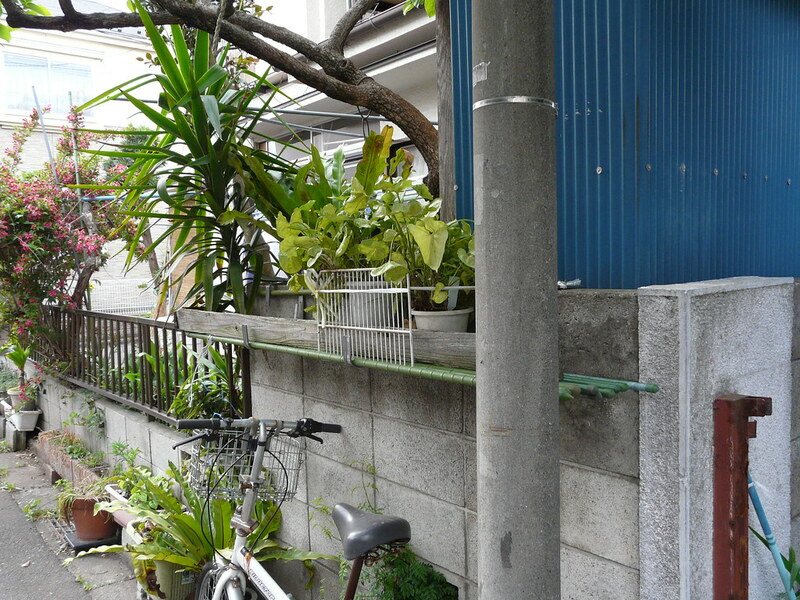 Simple and non-intrusive, and the perfect height for passing pedestrians to enjoy. 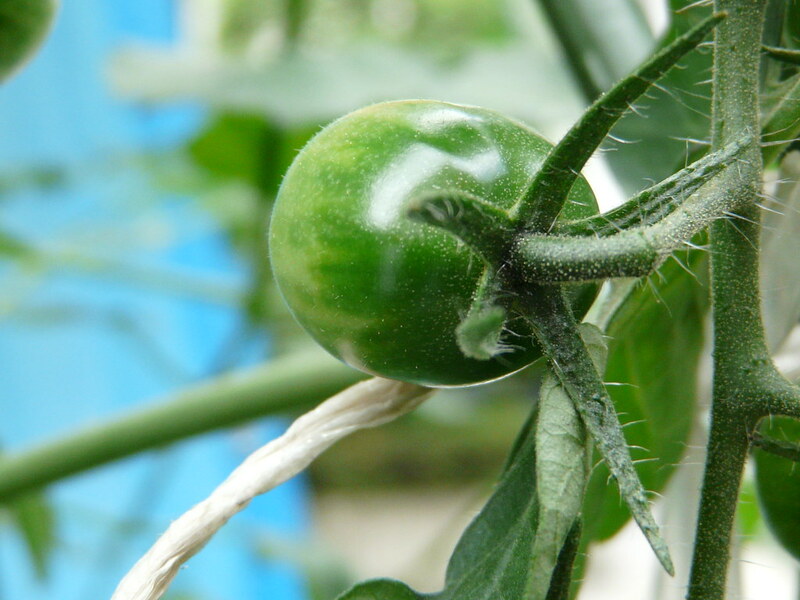 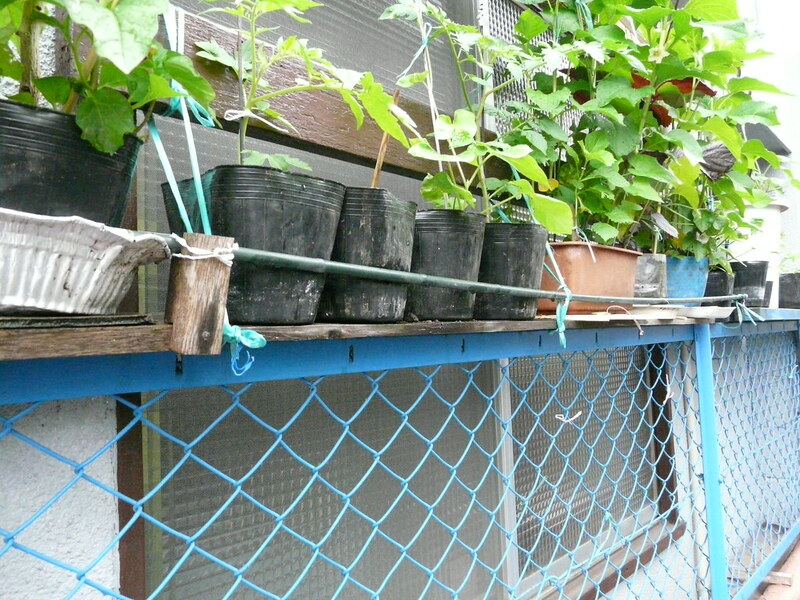 Simply constructed tomato garden – collection of standard plastic covered metal rods used for gardening. 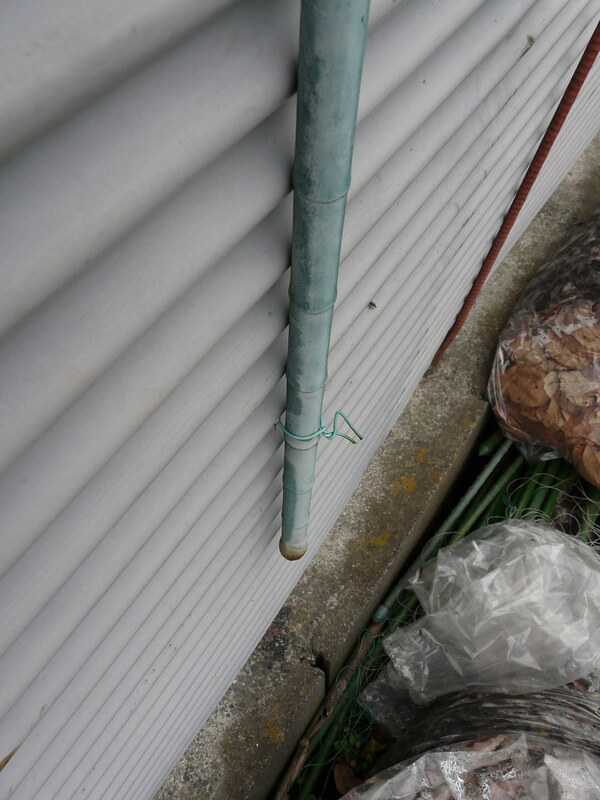 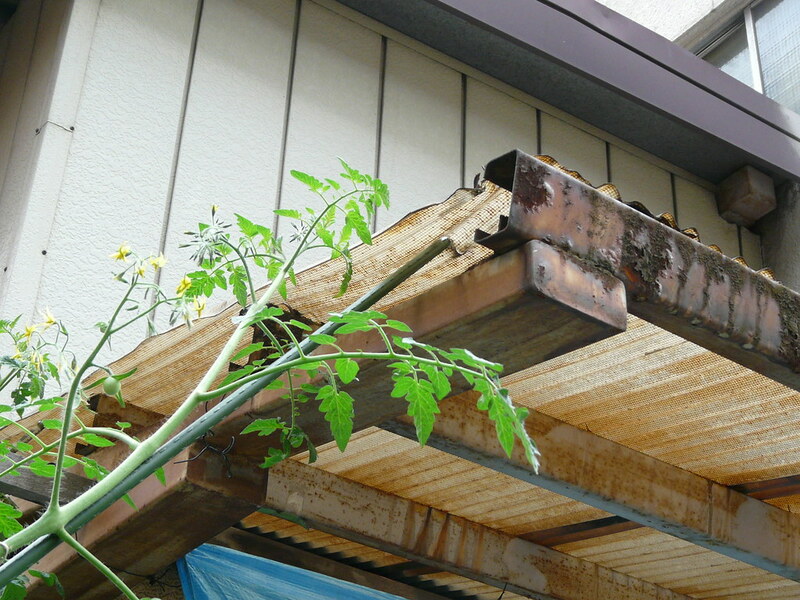 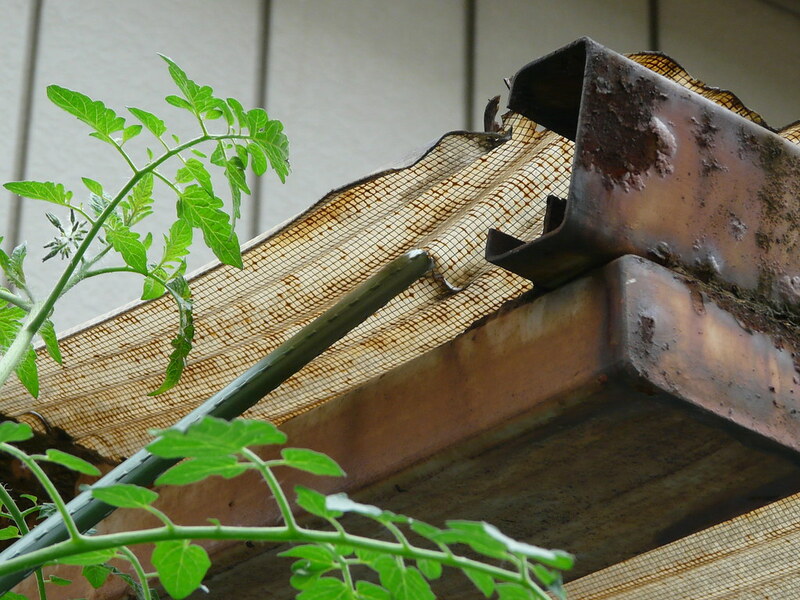 The rods pierce the old corrugated plastic awning to stabilize the structure. 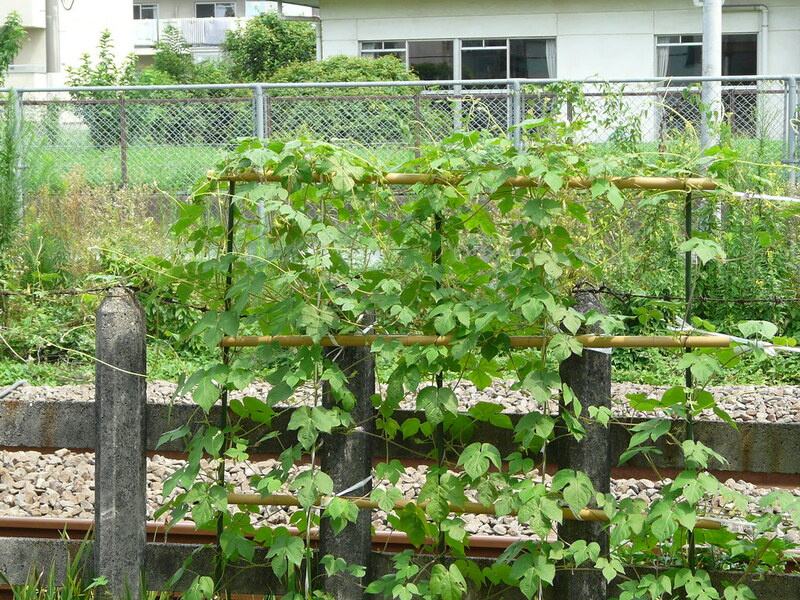 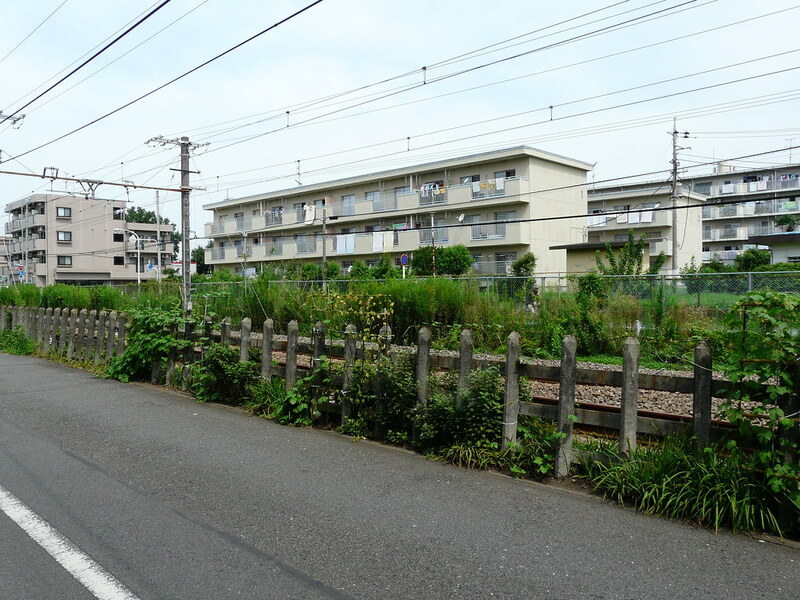 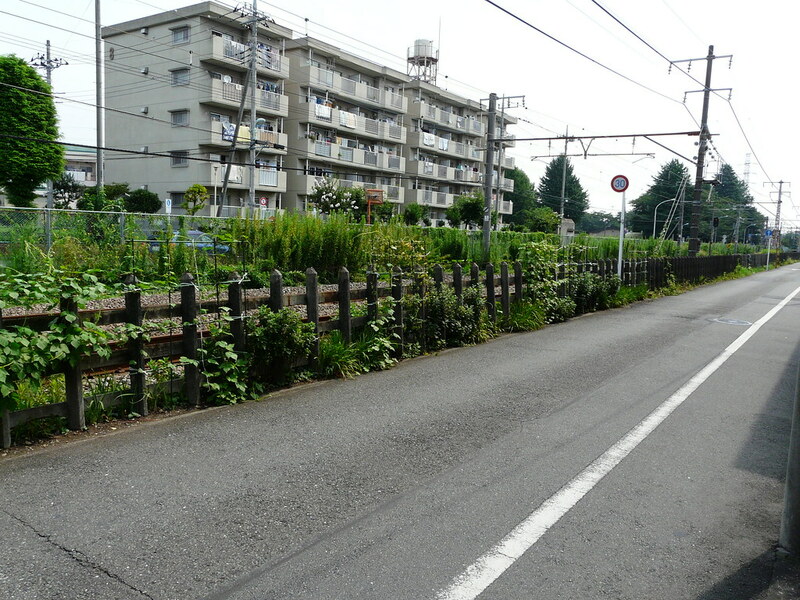 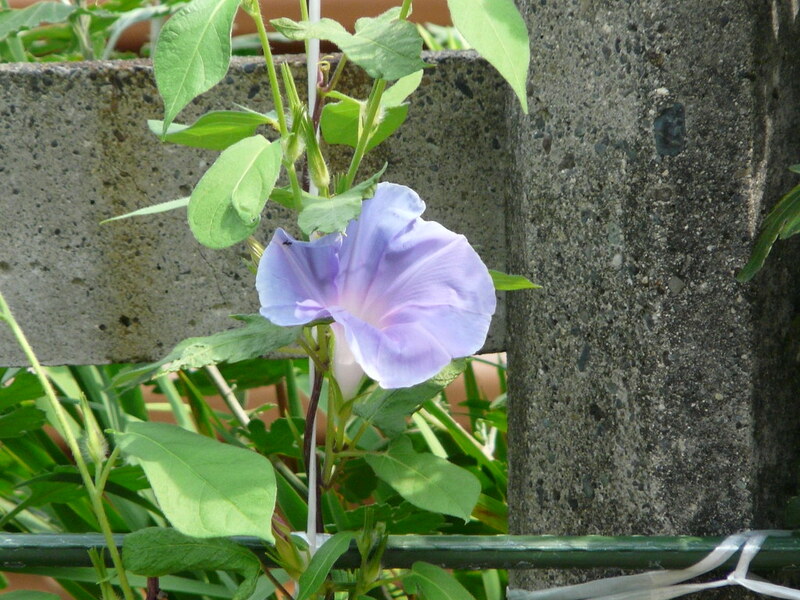 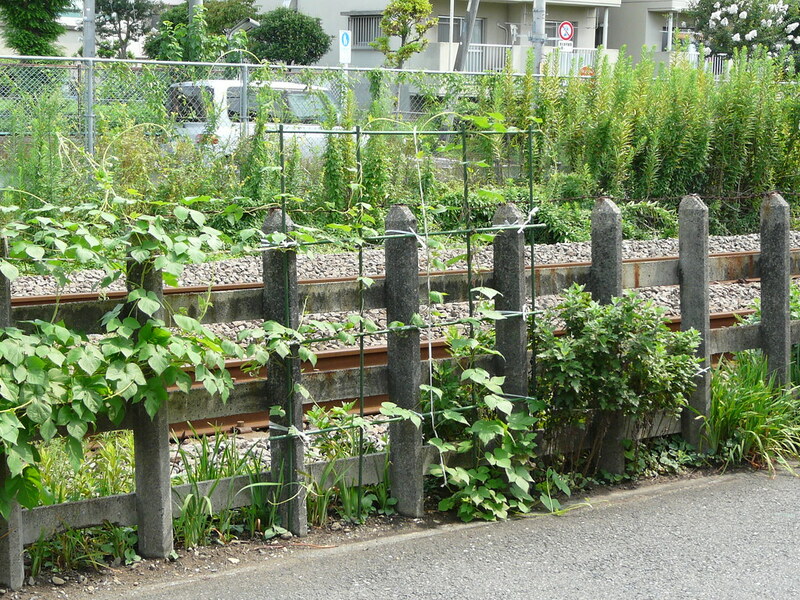 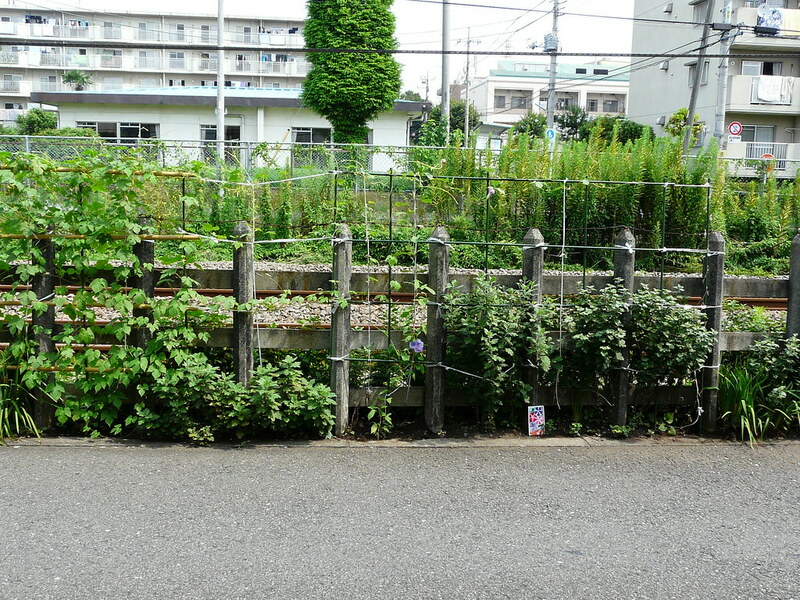 Along the narrow no-man’s-land between the railway track fencing and the road there is just enough space for residents of the house that lies directly opposite to create an asagao (morning glory) garden. 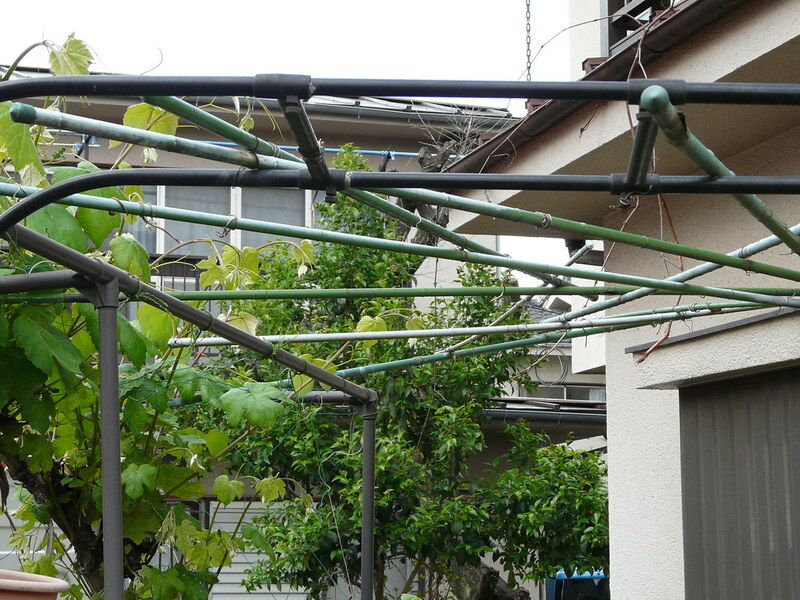 Constructed of plastic/metal gardening rods, bamboo and plastic twine this simple 3m x 1.5m (approx.) 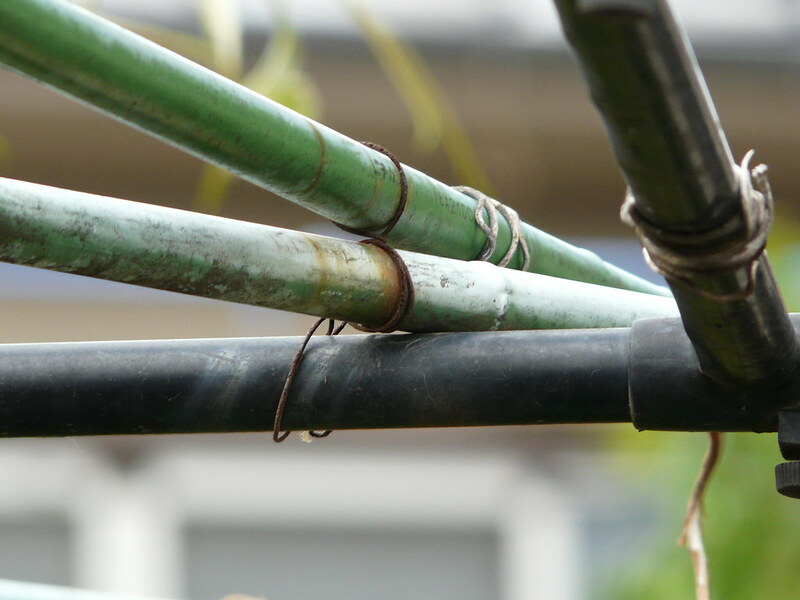 construction provides the right amount of support for the plants to climb and bloom. 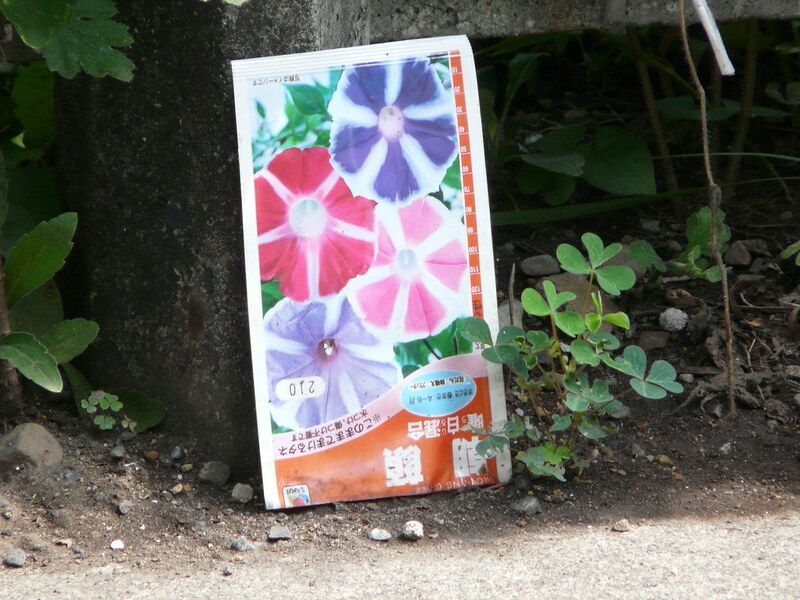 I like that the seed packet has been left at the base of the plant to let pedestrians know what is growing (or maybe it is a reminder to the gardener). 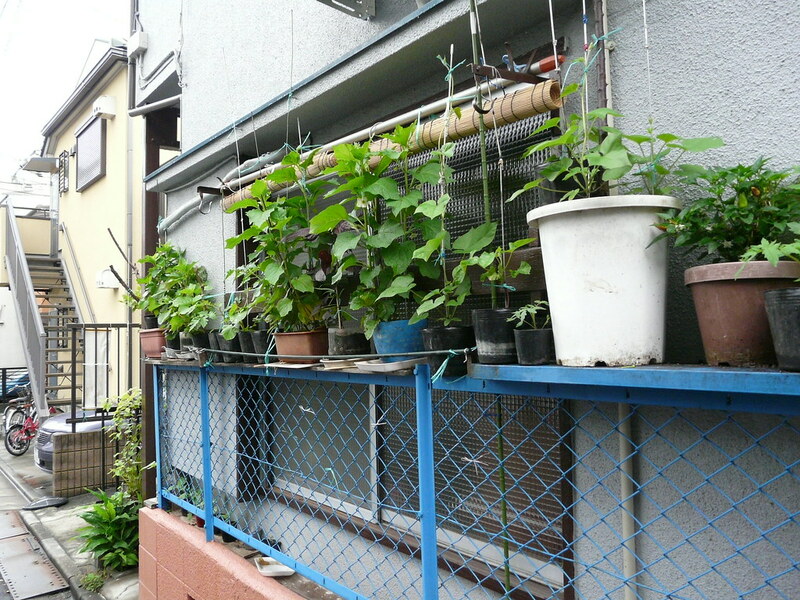 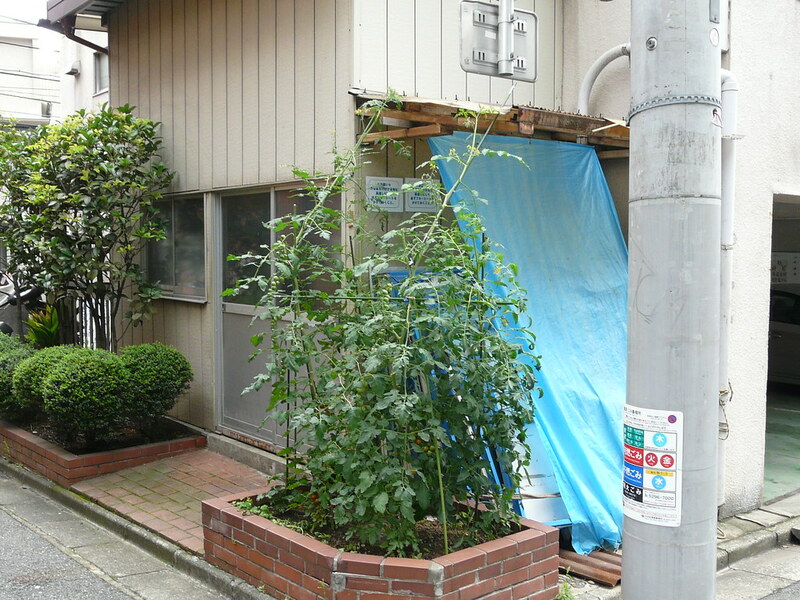 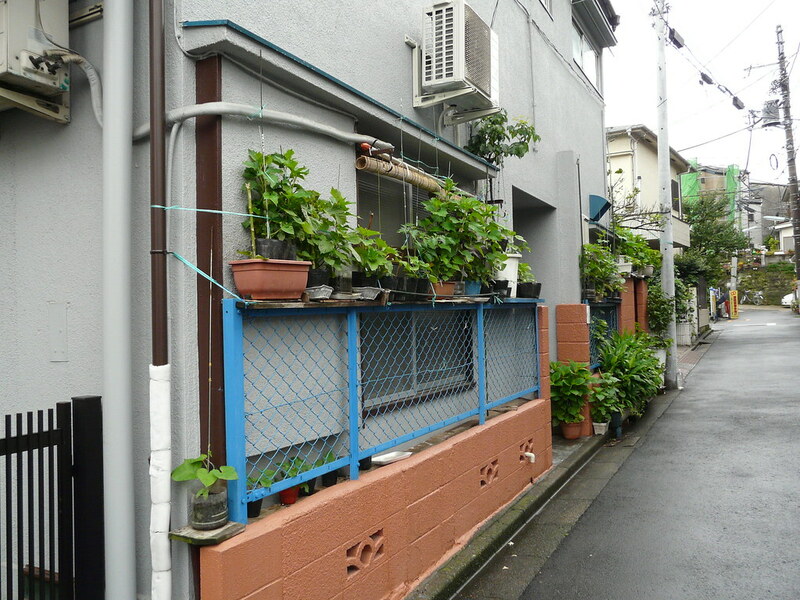 This is a great example of the affordable, productive, and enjoyable appropriation of unused/unusable space that is characteristic of Tokyo DIY gardening. 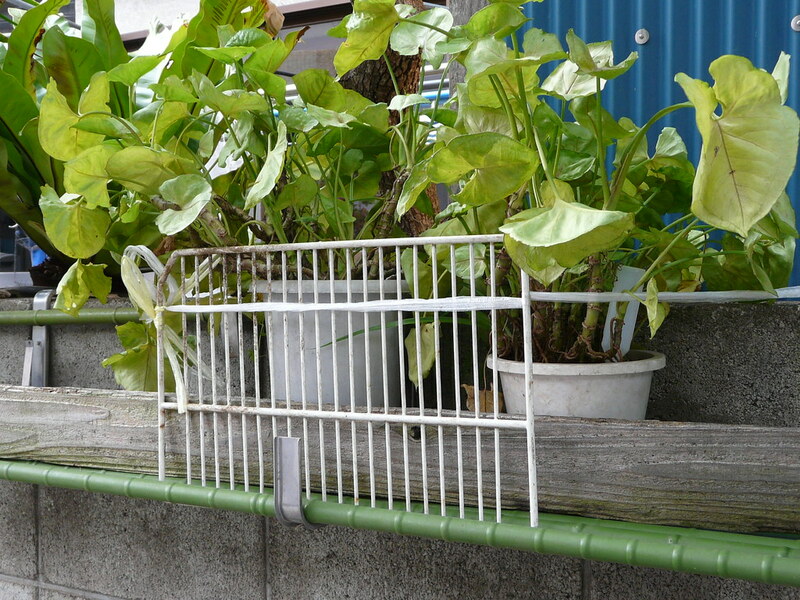 Pot plant shelf constructed on the exterior of block wall with plastic rods. 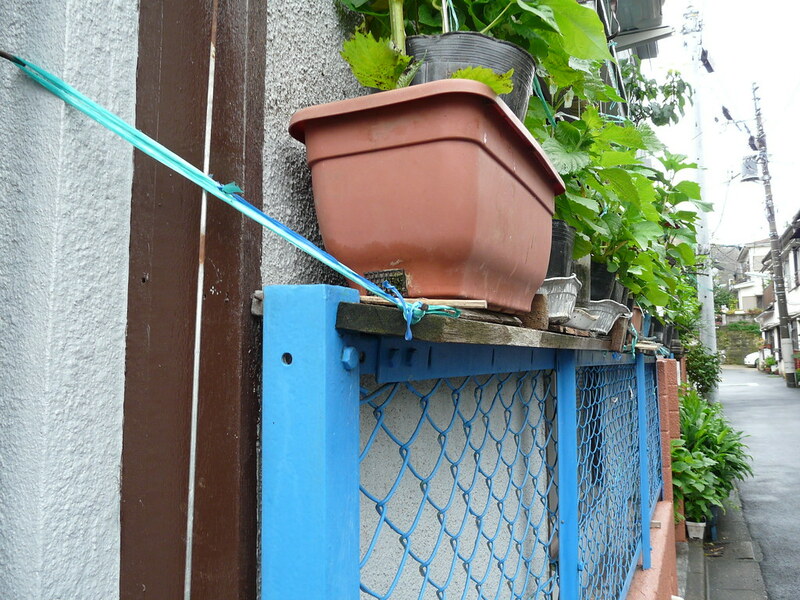 Pots secured with string and plastic grill. 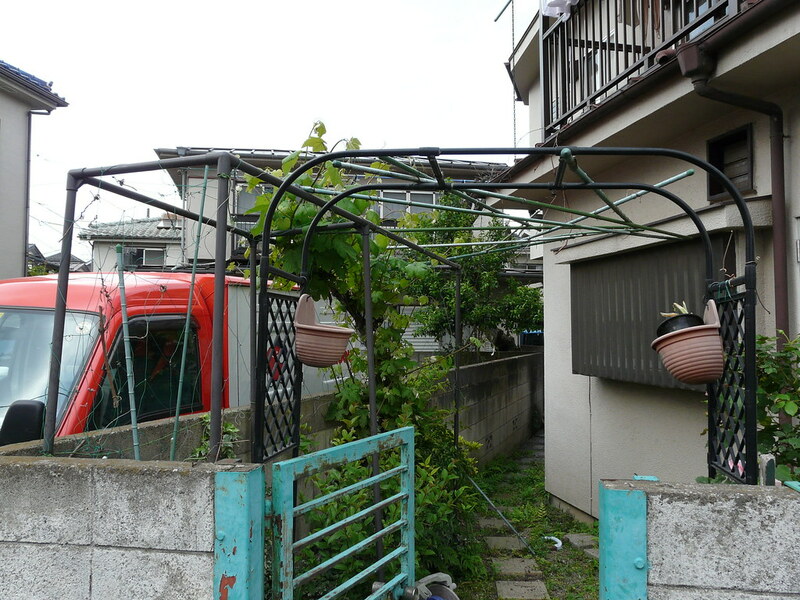 Entrace archway ready for a creeper or vine. 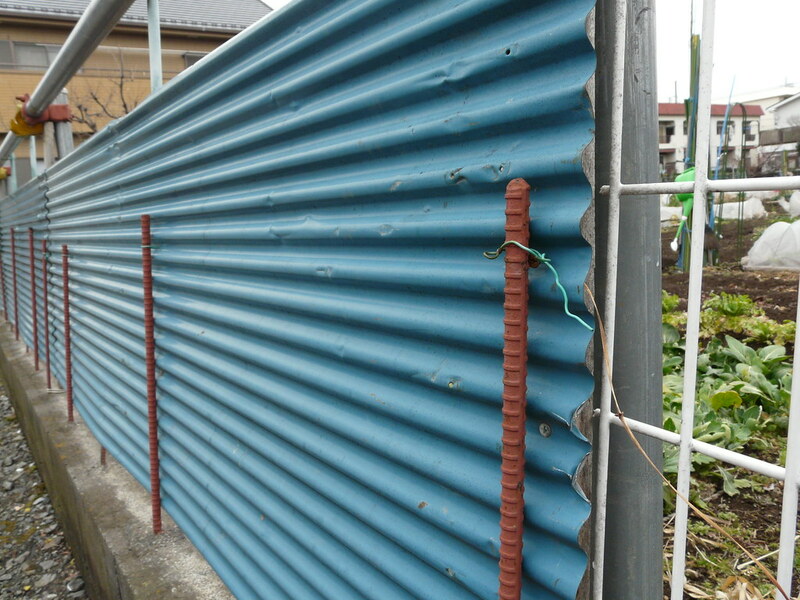 Constructed in wire and plastic stakes. 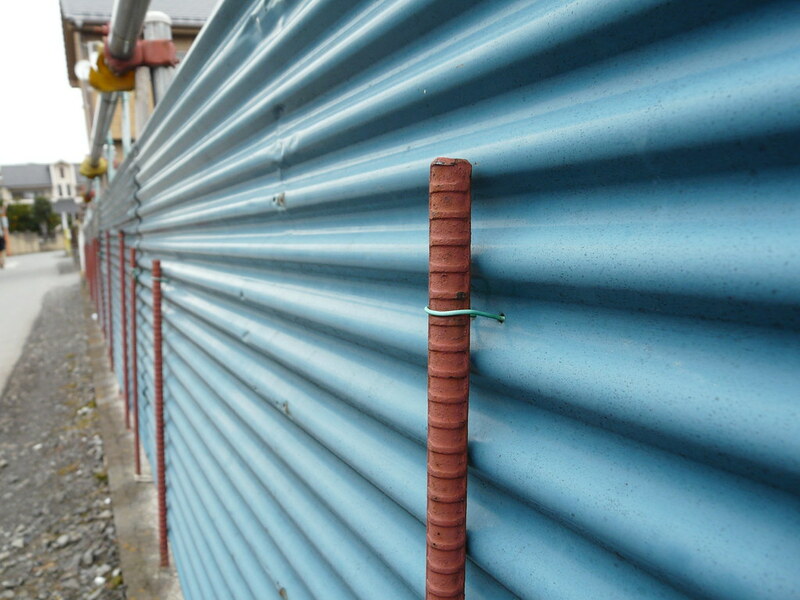 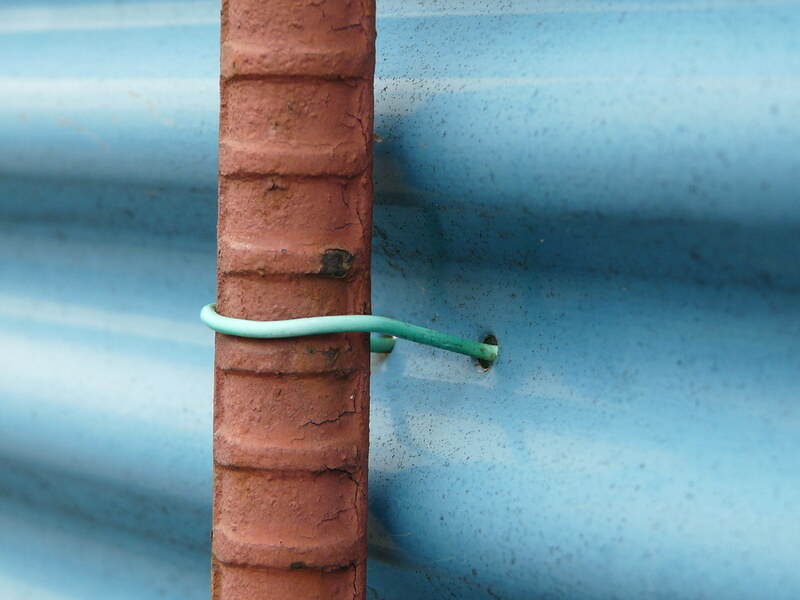 Corrugated iron sheets form a fence when affixed to metal reinforcing spikes. 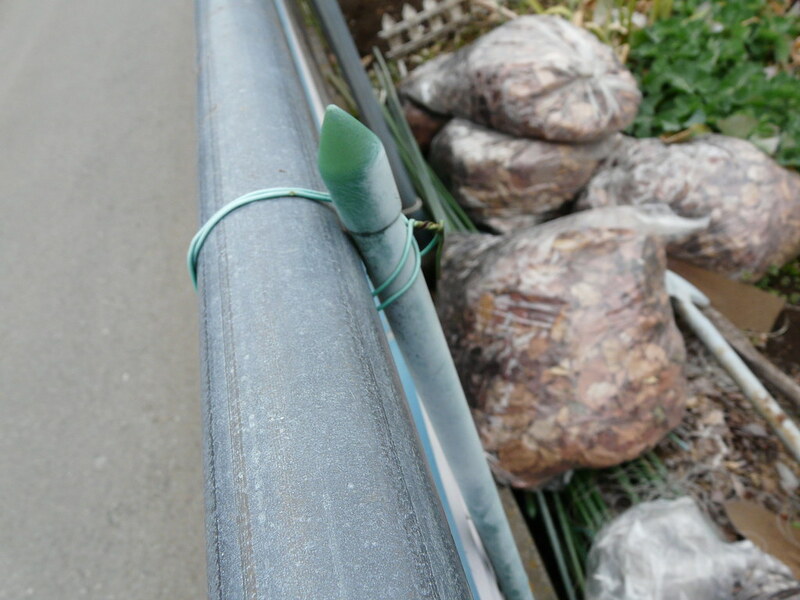 Plastic stakes fixed to the back provide extra stabilization.